Create safe walking surfaces with CROC grip Anti-Slip Safety Tape. Measuring 1.9 inches wide and 82 feet long, easily cut to size to fit your indoor and outdoor spaces. 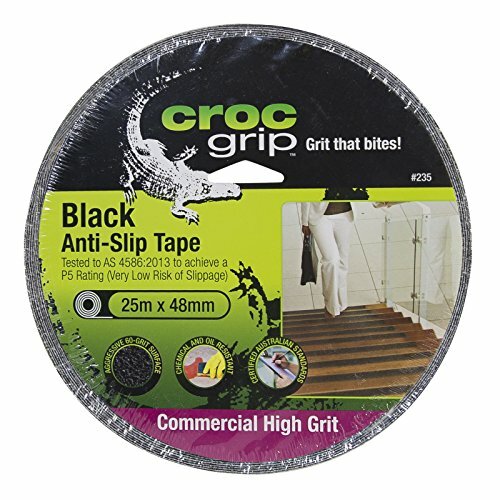 With a 60-grit surface, this anti-slip tape provides unmatched traction for stairs, walkways, and other surfaces.With reliable traction in hazardous areas, CROC grip can be used in warehouses, workshops, garages, and other industrial areasto prevent slipping and tripping on slippery surfaces. Place around dangerous outdoor areas like pools, docks, boats, and other surfacesprone to collecting water. Acrylic water resistant adhesive keeps the tape in place and safe from curling in grease, oil, or water -providing a safe walking surface and cleanappearance for your home or business.